A mountaineer’s training is specific, both physically and mentally. In addition to the specific expertise required for mountaineering, a mountaineer should be experienced in trekking and rock climbing. So, what are the best ways to develop and maintain the skills and fitness you need for high-altitude climbing? Contrary to what many believe, hard work in the gym is not enough on its own, though it is certainly useful. 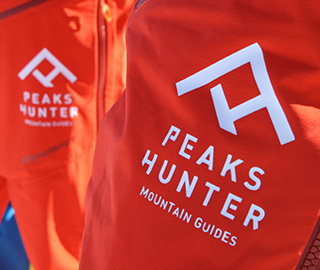 The best way of training for an expedition to the mountains is … to head to the mountains. There is no better place to develop strength, and to improve speed, agility, coordination, flexibility, balance, breathing and fatigue control, and certainly no better place to learn how to deal with the unexpected. Proper training requires time, dedication and focus on results. Here you will find some practical tips for getting ready for mountaineering. First of all, you need to be realistic about where you are in terms of technical ability and physical fitness and measure this against what is required for the climb you have in mind. This way you will be able to decide how much, and what kind of training is required to get yourself into shape. Once you have assessed your fitness level as objectively as possible, you can create a personalised training schedule, balancing it with your other commitments (family, work, personal life etc.). Running or cycling to work a couple of times a week, exercising during your lunch break, or even taking short walks into town are all good ways of getting regular exercise. We recommend training in a group, if possible, because it provides better motivation and, well, is just more fun. Remember to include a good amount of cardiovascular exercise (running, cycling etc. ), and to go hiking in the mountains whenever is possible, even taking challenging routes staying for a night or more in a mountain hut to help the acclimatisation process. Indeed, the higher the altitude you’re aiming for, the longer you will need to spend acclimatising. Those who don’t live close to the mountains should ideally do two training sessions weekly for a total of an hour. Perform some form of anaerobic exercise regularly to strengthen and tone lower- and upper-body muscles and help eliminate body fat. Never underestimate the importance of this period of acclimatisation as it helps minimise the symptoms of altitude sickness. These include tachycardia, tachypnea, hypertension, headache, nausea and insomnia. This is why you need to adapt your workload to your fitness level. It is also vital that you also plan rest periods, and keep to them. Nutrition and hydration are of particular importance during the acclimatisation phase. The basic principle is that the more time you spend acclimatising, the better you will be able to cope with the difficulties caused by tiredness, fatigue and the loss of aerobic capacity, and the better you will perform. Test the equipment you plan to use, especially your footwear. Consider how it will perform on the descent, not just on the way up. The psychological side of your preparation is of primary importance and should be never overlooked. In addition to your ability to move and maintain your balance over a variety of terrains, mental preparation is vital for dealing with discomfort, tiredness and the dangerous situations you might be faced with. Regardless of how physically fit you are, if you cannot handle fear or deal with unexpected or dangerous situations, you will struggle in a challenging, isolated mountain environment. This is why good self-awareness and an appreciation of your abilities and limitations are your best allies. Good judgement is needed to decide whether, and under what conditions, a climb should be made. A mountain environment is dangerous enough without the extra risks entailed by inadequate physical and mental fitness, tiredness or poor awareness of the environment. Your beliefs, ability to concentrate, feelings, self-confidence and self-esteem, the training, the management of anxiety and stressful events, the ability to solve problems are the basis not only for safe, fun high-altitude climbing but also for improving your performance.